Like many zombie fans, I read Max Brooks’ “The Zombie Survival Guide,” enjoyed it, and appreciated what it did for the zombie genre: it played a key role in drawing a whole new generation of fans into obsessing (it’s okay, you can admit it) over our favorite shambling monsters. 1. It’s such a radical departure from both the tone and scope of “The Zombie Survival Guide.” How could this man who had written a highly comedic, tongue-in-cheek pseudo-handbook dealing with how to defend yourself from an undead attack so abruptly switch gears and write a very serious faux-retrospective journalistic piece dealing with the very weighty issues and serious effects of the aftermath of a worldwide zombie outbreak? And more importantly, how could he possibly be successful with it? 2. His first book took so many people by surprise and was so wildly successful…even if “WWZ” was well-written, how could Brooks possibly hope that lightning could strike twice for him and he could have this second book become as successful as the first? 3. What – or more importantly, how – could Brooks possibly write in this book that would make it unique and set itself apart from the myriad of other “zombies invade, people get eaten” books that were starting to saturate the market at the time of “WWZ’s” release? Excellent review. I thought the book was excellent, though there were some pieces that didn’t resonate as well as others with me in the overall story. Still, it was one of the best zombie stories ever written and was extremely compelling. It’s been nearly three years since I read it and I probably need to go back and take another look at it again. I think this is one of those books that transcends the genre. Fantastic review, and you hit some very solid points showing how the journalistic style contributed to the realism of the story. I enjoyed The Zombie Survival Guide but I really do think World War Z surpasses it on so many levels. I own both novel and guide and enjoyed them thoroughly. On a side note, I have come across a few other zombie fiction work you might enjoy. Two novels written by J. L. Bourne, Day by Day Armageddon and the continuation Day by Day Armageddon: Beyond Exile. Maybe you could review these? @Patrick: I did the exact same thing: read this book originally a long time ago, and went back and read it before I reviewed it. Definitely a book worth multiple reads, for sure. @Peter: Thanks for the kind words, and I agree completely. Both of Brooks’ novels are excellent, but WWZ takes the cake. @DT: Glad you enjoyed the review! 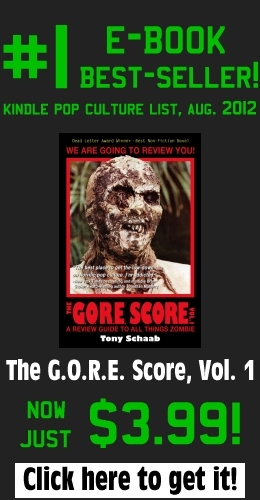 Don’t tell anyone, but one of the five reviews I wrote that are only available in the book version of “The G.O.R.E. Score, Vol.1” is for “The Zombie Survival Guide!” I haven’t read either of JL Bourne’s books yet, but his publisher sent me a copy of “Beyond Exile” a few weeks ago that I’m desperately trying to get to, and I’m definitely going to have to go out and get his first novel as well. Reviews for both will definitely be on the site in the not-too-distant future, so thanks for reading and stay tuned!